Five months ago, the Puerto Rico legislature tried to pull a fast one, and “privatize” the beaches of Puerto Rico on the last day of session. The public outrage was so fierce, that the legislature backed down. But now, Gov. 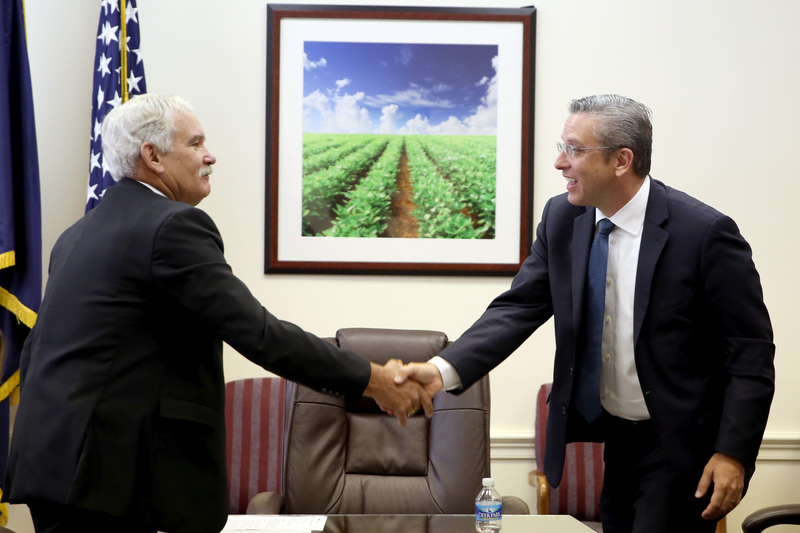 Garcia Padilla is doing the exact same thing…with the public schools of Puerto Rico. By “executive order” he ordered the sale of more than 350 school buildings and campuses. He did this on Nov. 21 but then immediately left for Spain…and finally disclosed it four days later, on Black Friday, the day after Thanksgiving…when few people were paying attention. An executive order is a powerful weapon: especially when there is no officially scheduled legislative session, to question or oppose it. With the stroke of a pen, a governor can issue an immediate mandate which is immune to legislative veto…and minimal, if any, public review. That is what Gov. Garcia Padilla just did with over 350 public schools, and the teacher’s jobs inside those schools. They are now all on the chopping block. The current governor, Garcia Padilla, closed over 150 schools during his single term (2012-2016). In two years alone, from 2014 to 2016, he closed 135 of them. Over 350 schools were shut down, over the past 8 years. The school closures were pressured by the hedge funds that hold Puerto Rico’s debt. These hedge funds want more schools closed, and more teachers fired, in order to accelerate the re-payment of Puerto Rico’s “debt” to them. But Garcia Padilla took it one step further. He jumped from closing 350 schools, to selling 350 schools and their surrounding campuses. In doing so he beat the Financial Control Board, governor-elect Ricky Roselló, and the PNP political party to the punch. He deprived them of the financial benefits from brokering this deal…by cutting the deal himself, as a lame-duck governor, who will not have to face the voters again. And now those financial benefits will be his. In the world of backroom politics, Wall Street insider trading, and lobbyists with cash-filled briefcases, it is difficult to prove that Gov. Garcia Padilla – or his family and associates – received a bribe for this “executive order” to sell 350 schools. In the last days of his administration, the character of Garcia Padilla is beginning to show. The Federación de Maestros and Asociación de Maestros Local Sindical should contest this executive order immediately. They should pursue injunctive relief, restraining orders, Article 78 proceedings…every legal measure at their disposal, to prevent this accelerated sale of public properties. They should mob the media and swarm the streets, with immediate and fierce opposition to this underhanded sale of their school buildings, and their jobs. Make no mistake about this…once those 350 school buildings are sold, the jobs inside those buildings will never return. All the double talk about “mergers” and “consolidations” is just that…double talk. Those jobs will be gone. This holiday-season maneuver by an outgoing governor is a general betrayal of the entire island…but it is a specific attack on the union movement. If these 350 schools are sold – quietly and with no opposition – then the entire public infrastructure of Puerto Rico will be up for grabs. The electrical grid, water supply, highways, bridges, hospitals, prisons, public housing – it will be open season on all of them, and on every union and municipal worker on the island. It is clear that the PPD and PNP are not two parties. They are only one party…the PLP…the Party of Lining their Pockets. Don’t let them do it ! Do NOT allow these 350 schools to be sold…not without a fight. I don’t know who I’m replying to whether Remy or Pepito. Whoever you are, you may be right about some of the issues you mention, but please don’t call us embarrassment, because that shows you no nothing about the history of the struggle for independence in Puerto Rico and you dishonor the memory of those who died fighting for it. Furthermore, I don’t remember making a comparison of Cubans and Puerto Ricans. Don’t make accusations on a people without researching the facts. Puerto Rico was forcefully invaded in 1898 when it was on it’s way to becoming a republic, American citizenship shoved down it’s throat, and from that time a struggle for independence begun and so was the most well planned psychological brainwashing began, but this subject is deep, long and painful, and honestly a waist of time, because hyou would not understand. So 5hey closed all this schools ,they should used the buildings for nonprofit organizations .Its a shame that PR is been sold to the highest bidder like Greece now. The Cuban’s were willing to die ( be killed ) to regain their sense dignity and autonomy. That’s the major difference between an islander Cuban and an islander P.R. The P.R.’s are not willing to die for their freedom and a regaining of their dignity. Both had guns “pointed at their heads.” The islander P.R.’s have seemingly resigned themselves to a fate of their own making. Even when it’s told to their own face that they are a colony by the colonizer! When you’re dealing with a socio-pathic power…it only responds to one thing: The same brute force it imposes on its victim. Even if you succeed in winning, you still never get the colonizers respect. Just the fear that you will rise and do it all over again, is what causes them pause. You always have to be on the defensive afterwards. What is it that the P.R’s aren’t learning from the Cuban experience?? Nothing it seems. And, so what you have on this site, is one looooooong constant lament. Lament, lament, lament. It’s become an embarrassment. The Cubans had a problem. They effectively dealt with it the best they could. And the longer this situation goes for the islander P.R.’s; and, the more people around the world become familiarized with their condition; and the longer the islander P.R.s do nothing….The less sympathy will the world have toward P.R.s 118 yr plight. The Cuban’s figured it out in a fraction of that time. They went all the way. They put it all on the line. It seems that a temporal “convenience” of life is worth more than liberty and dignity to islander P.R.s. Que estupidez y trajedia a la vez. “I think terror may not be the trouble, IT’S ALL THE TROUBLE. THE TERROR BEGAN WHEN THE SPANISH INVADED. 500YRS+ AGO. THAT “TERROR” WENT ON STEROIDS IN 1898, AS THE ISLAND WAS ABOUT TO GO SOVEREIGN. but the debt that Puerto Rico may be in is what may have caused it. THE DEBT HAS BEEN CAUSED BY MISMANAGEMENT AND CORRUPTION WITH THE BACKDROP OF TERROR. IT’S BEEN GOING ON FOR A VERY LONG TIME. WHERE HAVE YOU BEEN? The point is we should let P.R.’s education system keep teaching children and adolescent’s, unless there aren’t anymore left to teach. THE POINT IS, IS THAT THE EDUCATION SYSTEM ISN’T WORKING. LOOK WHAT IT DID FOR YOU. WHAT HAVE THEY LEFT OUT IN THAT TEACHING ALL THESE YEARS?? It may also be that there are serious diseases spreading because of mosquitoes’, SO, MOSQUITOES ( ZIKA LAST 12 MOS ) MAY HAVE CAUSED ALL THAT’S HAPPENED OVER THE LAST 118YRS?? but I beg to differ. In general if the American country is going to own the schools they should hire Americans to teach both American and Puerto Rican’s that reside there. AN ICBM JUST FLEW 100FT OVER YOUR HEAD, JOSE; AND YOU DIDN’T SEE OR EVEN HEAR IT. We should work as One! Owning acres of property for corporate gain should not be the answer.” JOSE, READ REPUTABLE HISTORY ABOUT THE SUBJECT, INSTEAD OF EMBARRASSING THE PR COMMUNITY WITH WHAT YOU SAID. IF YOU ARE A P.R., AND IF THE WAY YOU THINK IS REPRESENTATIVE OF THE VAST MAJORITY OF P.R.’S, IT MIGHT BE PART OF THE REASON WHY D.C. IS GIVING SO MUCH ATTENTION TO CUBA RATHER THAN P.R. WHEN IT SHOULD BE THE OTHER WAY AROUND. QUE TREMENDO ERES. The school buildings that are being sold were closed due to a really low student body. The massive exodus that the island has been subject to has aged the population as young couples with their children have moved to the United States, this has translated in schools being closed and former students being sent to the next closest one. When those buildings closed they turned in to a sanctuary for crime, drug addicts, and were vandalized, ultimately turning in to a headache for the communities they are located in. The government does not have the money for the upkeep of these buildings and I don’t see the president or members of the Teachers Federation volunteering for it. PR’s governments for the last 30 (if not 40) years, has robbed from Paul to give to Peter. While the Ponzi scheme was working (under control) everyone on the island was happy! Now that the scheme has collapsed (like a house of cards), the people of PR are surprised and outraged that the different administrations they elected time and time again, could do this to PR (i.e. them!). My old man use to say……you made your bed, now lay in it! Gov.Garcia Padilla is just another coward and crook starting from Luis Muñoz Marin and every governor under the jurisdiction of the United States.Vende Patria puppet. They consider themselves politicians and what they really are errand boys for Jim Crow. Repeal the Jones Act idiotas! (Cree usted que esas escuelas se cerraron después que llegó la Junta?, debe asesorarse. Esas escuelas se han ido cerrando desde la administración de Fortuño porque no tienen uso por falta de estudiantes. Muy cerca de donde vivimos en 2011 cerraron la escuela Gautier Benítez, la alcaldesa de San Juan la convirtió en la Casa Dominicana. No argumentemos por tregiversar, tenemos que entender la realidad nuestra.) Ese comentario es hecho por otra persona pero esta diciendo algo que es cierto. Al fin y alcabo a demostrar lo que en si son. Excelente, Nelson. Qué la denuncia suene alta y clara. Gracias por tus esfuerzos. That saddens me profoundly. However, the truth is that if Puerto Ricans would have paid attention to the leaders who fought so ardently for the independence, this would not be happening now. We have lost our leaders, Mari Bras, died, Ruben Berrios, is now aged, and others who were strong went on trucks with loudspeakers to advocate the independence were met with deaf ears. I’m sorry. When I was young, I did what I could, I took part in demonstrations, attended meetings, I believe in our independence. Now I am also old and most likely leaving soon. We are losing our island, and there isn’t much time. Something has to be done, and the whole world needs to hear it! I can not believe that the Children of Puerto Rico are paying for the Crooked Government that Robed the people are letting the control board making the lives of their own people suffers for their own Crookedness. I also Blame The United States Congress, They knew What was going on for the Past 4 Years in Puerto Rico and just did not do anything to Protect the Welfare of the people of the Island, They are as much to Blame for this mess. There are no words to really describe this … 350 public schools CLOSED & SOLD … no regard for students & teachers! FIGHT, PR … fight! !